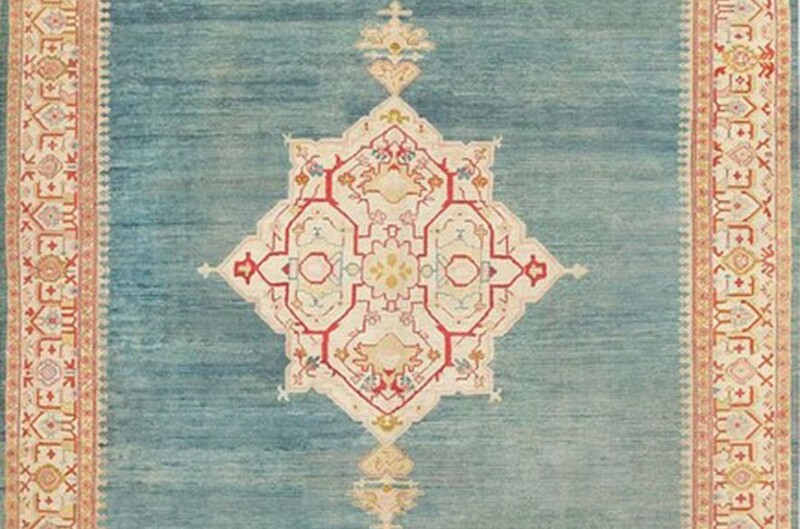 THE OUSHAK RUG - Deep blues, golds, grays, crimsons, teals and coppers are the norm. Located in the interior of modern Turkey, the city of Usak serves as the crossroads connecting the Central Anatolian plateau and the sea straddled Aegean Region. Fortunately, due to its placement between the two areas, its 187,886 citizens are able to enjoy the best of these two areas’ climates, contributing greatly to industrial, agricultural and artistic pursuits. Though well-known for its mercury and sugar industries, Usak is better recognized as a city that has produced some of the region’s most notable rugs and folk literature in history. The name itself is translated to mean “lovers” and “minstrels”, however, residents often prefer the second translation due to its fondness for the arts. Prior to the industrial era, the city of Usak had already established itself as a principal producers and exporter of Oushak rugs and carpets, sometimes being referred to as Anatolian or Holbein carpets. 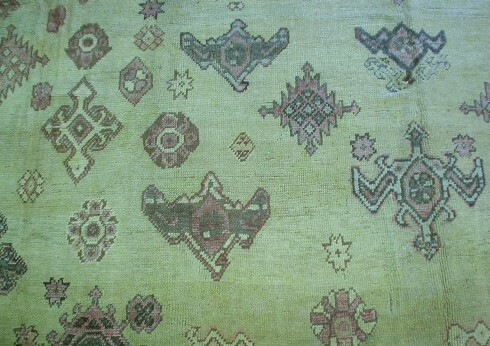 Nevertheless, they are primarily known by the Oushak name today, Anatolian carpets being identified as those coming from the country of Turkey in general. Alternatively, Holbein carpets became a title referring to the adoration of Oushak carpets by the 16th century German painter Hans Holbein the Younger, who often detailed their beauty in meticulous paintings he produced in Europe. In the beginning of their history, the Oushak rug was highly prized and revered by the leaders of the Ottoman Empire, yet their discovery by Europeans quickly led to a spike in popularity as early as the 15th century. Because of this, no other Turkish rug has enjoyed the Oushak carpet’s notoriety over the centuries, largely due to its use of extraordinarily lavish materials and the sheer quantity of those having been produced by the area’s weaving artisans. Though its popularity dipped slightly during the late 17th century as carpets of European origin were introduced to consumers, the Oushak rug had its own renaissance in the 1800’s, again being sought after by collectors and nobility. 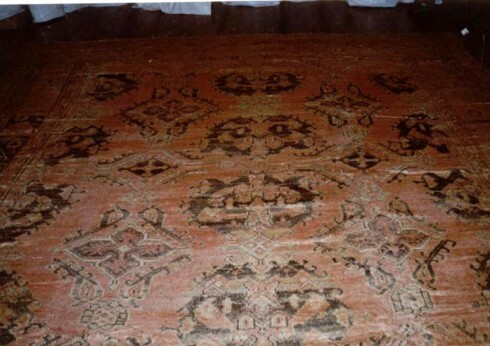 Since that time, it has remained a permanent fixture in the antique rug marketplace, and even today is one of the most adored carpets among Persian and Turkish rugs. 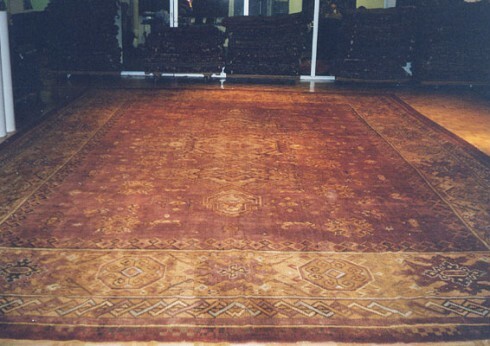 Oushak carpets are often recognized by their use of a rich color palette that is, many times, derived from only the finest natural dyes indigenous to the region. Deep blues, golds, grays, crimsons, teals and coppers are the norm, yet there are times when these shades can be flanked by even more bold hues, including orange, lime green, muted reds and soft straw-tinged creams. The designs are primarily woven in larger knots on top of an all-wool foundation, built from silky, almost translucent wool coming from the local herdsmen surrounding the city. The most distinctive design in antique Oushak carpets is the central medallion, or “Star Oushak”, dominating the central portion of the rug with its intricately woven ornamentation. The rugs also often feature complex floral vinery and tracery, as well as the split-leaf design popular among Turkish carpets and rugs. Still, while each Oushak rug is unique in its own right, they all have one thing in common with others of the same style – their astonishing brilliance.